Race your high-speed sports car along six long tracks and reach the finish before the clock runs out. The track is full of obstacles, and although there are arrows to tell you which direction to go, you'll still need quick reflexes, and memorising the course is essential if you want to reach the later tracks, as the time limit is quite tight. You can also use some turbo boost to increase your speed, although your supply is limited on each track. 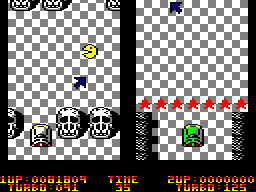 The graphics are OK, although the backgrounds can be garish, and the chequered background on the third track is sore on the eyes. The music is mediocre as well. Despite this, it's not a bad game, although it is lacking in originality. 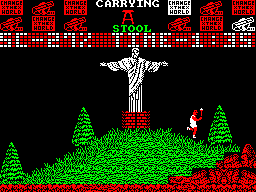 Released to coincide with the Sport Aid '88 charity event, this arcade adventure sees you controlling Sudanese athlete Omer Khalifa and attempting to light six cauldrons and raise six flags in each of the world's continents. Once this is achieved, you must go to the United Nations building to light the final flame. You really are in a race against time, as the clock is ticking constantly, and if your time runs out, the game ends. You will need to find objects to pass some obstacles, and you must also avoid getting wet! This is a reasonably good game with well drawn graphics, and it also includes a rendition of Peter Gabriel's Games Without Frontiers. However, it's too easy to die accidentally, and the inclusion of a few 'mazes' with a mass of interlinked exits can make it a rather frustrating game to play. 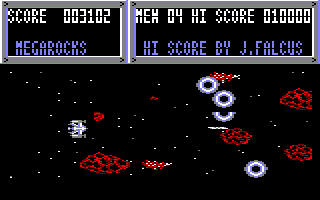 There are plenty of horizontally scrolling space shoot-'em-ups around, and this is not one of the better ones. Pilot your spacecraft through moons, rocks and space dust to reach the other side of the galaxy, shooting and dodging the waves of aliens on your way. There's little to be said about the graphics and the sound effects, but three things let this game down; the slow scrolling, the ineffectiveness of your laser (which means that there's less shooting and more dodging) and the total lack of power-ups to make things a bit more interesting. 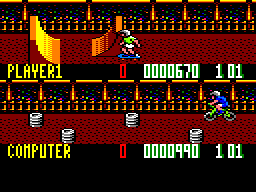 This was one of many games to be released at a time when both BMX riding and skateboarding were popular, but this combines both activities. You can either play against the computer or a friend as you perform stunts on three courses and attempt to score as many points as you can within two minutes. And, erm, that's it. Actually, it isn't – there's a course designer included as well, but it's really awkward to use. You'll see all of the game within ten minutes, but at least there's some brilliant high-energy music to listen to as a bonus. Some time ago, a nuclear reactor on a colony on another planet exploded and contaminated the entire landscape with radioactive material. You have been sent to clear the mess and turn each sector into a 'safe zone' by collecting tokens. 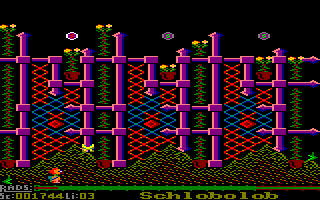 This game features some very odd mutated creatures and a wide variety of puzzles, as most of the tokens are in fairly inaccessible places on each sector. Despite the nice graphics and some stonking music, the game is difficult and the character you control can be quite awkward to get him to do what you want. The Soviets have launched several nuclear missiles, aimed at major US cities. As Squadron Commander of the US Defense Space Station, your goal is to reach and destroy the launch sites, then infiltrate and sabotage the Soviet Defense Center. 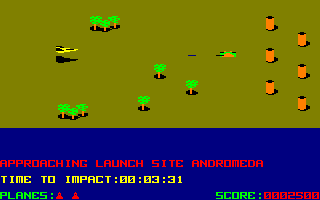 This early wargame features average sound and graphics but several different action scenes. As in Beach Head, you mustn't lose too many lives in the first mission or your chances of completing the game will fade away. The game is rather difficult, even on the easiest level. The first screen, in which you have to take the planes off the space station, is really frustrating and will cost you many lives. However, the following missions are great. Watch YouTube videos of this game by: Metr81, Xyphoe. You are taking part in a rally across the African desert, but first you'll need to obtain money. You must select three sponsors and answer various questions, most of which require some quick mental arithmetic. If you obtain enough money, you must then buy a vehicle, fuel and supplies to keep you going. 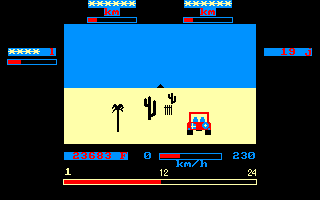 Once you're off, you drive across the desert, steering your vehicle left and right to dodge the obstacles and stopping every so often to rest. During the journey, random events can occur which will delay you or cost you money – and be careful not to wander too far off course! The game is written in BASIC and it really shows. The graphics and overall presentation are ugly, the driving section is very slow and dull, and the questions the sponsors pose at the beginning of the game are very difficult indeed, making it all the harder to buy a decent vehicle. 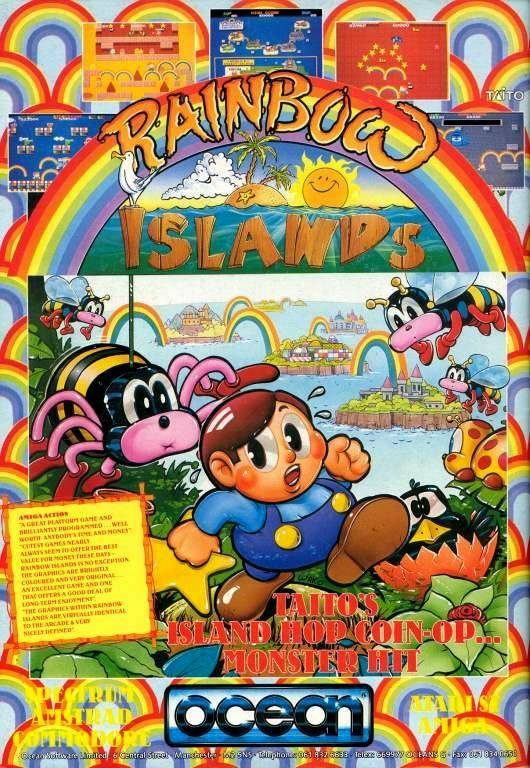 Bub and Bob are exploring the Rainbow Islands and must defeat the guardians on each one, before encountering Doh on the seventh and final island. 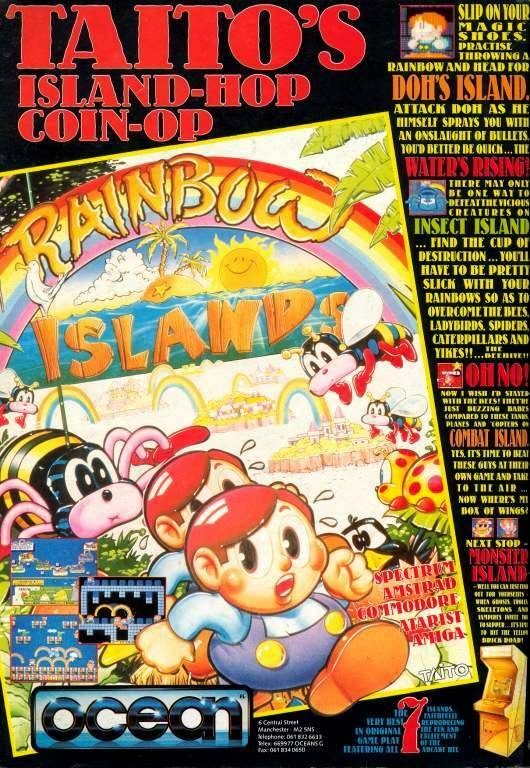 You use rainbows to kill monsters and also to climb on, to reach the top of each level before the tide comes in! Lots of bonuses are to be found, and if you collect all seven gems, you'll get a mega bonus. This game is everything a platform game should be. With amazingly colourful and cheerful graphics and oh-so-cute sound effects and music, and the sheer amount of power-ups and bonuses scattered on each level, you won't forget this one in a hurry. Watch YouTube videos of this game by: Axelino, jgonza, Xyphoe. This is an overhead racing game which can be played by one or two players. Four rally cars race each other around six tracks, and you must complete eight laps before the other competitors; failure to do this means you don't qualify for the next track and the game is over. In fact, it's quite likely that you will never qualify for the next track without cheating. Your car is extremely difficult to control, even at moderate speeds; it behaves as if it was driving on ice! Meanwhile, the other competitors drive perfectly without ever crashing once. It's a shame, because the graphics are quite impressive (although all four cars are the same colour) – but there are many games of this type, and this is certainly not one of the best of the bunch. In this simulation, you are taking part in a rally which consists of three stages. You'll have to act as both pilot and navigator, and read the supplied map carefully in order to plan the shortest route. Each stage has several time controls, where you must stop and enter two letters correctly. These letters are marked on boards which appear on the side of the road just before the time control, and you'll need to slow down to read them. You'll also need to watch out for various other hazards. The navigational aspect of this game is nice, but controlling the car is a nightmare, particularly in wet conditions (which is often the case). You'll crash your car and receive time penalties with monotonous regularity, so qualifying for the next stage is just too difficult.